I've only been away from my laptop for two days and I feel out of touch. It's not that much has happened, it's just that feeling that you're neglecting something. Still, I don't think I can be guilty of that so far this year, because even if I haven't been writing about it, I've been listening to it! Anyway, onto this review. 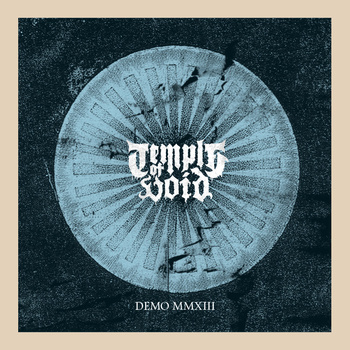 Detroit, Michigan's latest noise makers Temple of Doom have recently unleashed their debut demo tape. Having released their 3-track demo tape through Till You Fukkin Bleed Records and also pressing a subsequent CD run, they're now picking up press coverage and live shows as they build on their momentum. Vocalist Mike Erdody is even a live member of the mighty Acid Witch! Name dropping aside, things look really bright for Temple of Void and I'm looking forward to getting stuck into this tape. Temple of Void certainly lay the guitars on thick. Their sound is a very modern take on the doom/death blueprint that initially comes across as more death than doom. Beyond The Ultimate features plenty of progressive elements and the screams from Mike Erdody have a hint of Swe-death to them. That said, they are mighty and thanks to the good production, they've got that all-encompassing element to them, just like the band as a whole. In terms of melody, it's all in the low-end. What melody there is, is buried behind the vocals, leaving a menacing layer to wash over you when they do get the chance to shine. The solos are opulent and come across very well, especially with that nice live echo within the mix. As the intro gives way to those crushing screams, Dark Tranquillity comes to mind. I'm not sure why, but it's probably due to the intensity and tone of the vocals. The music is more stop-start in places with time-changes and further progression. The death metal element is played to more as well, due to the shorter track giving Temple of Void a bigger sense of urgency. There's still plenty of room though for the band to demonstrate the highly proficient musicianship within their songs. Bargain In Death takes things to a whole new evil level it seems. It's got more doom and is dripping with more of that dank death metal atmosphere that only doom/death bands seem to be able to create. It's like they wanted to write a funeral doom song and then spent all night listening too Dismember! Towards the end of the track they go into a fuzzed out hoedown of sorts too, with screaming guitar and semi-improvisational rhythms. It’s a great way to end the tape, as it takes you aback and makes you realise that they’re influenced by more than just death metal, so hints a big things to come. Both veteran and new metal fans should know about Temple of Void. They aren't too fussed about being super clean in terms of their sound yet they inject it with modern textures that are subtle and not in your face. For a band so new, they've made a good case for metal in 2013 and beyond. Let's hope we hear a lot more from them! From there you can also purchase the demo on tape of CD, as well as digitally. Ash Borer - Cold Of Ages 12"
Esoteric Youth - The Burden of Living 7"
Trial - Malicious Arts 7"